The Xerox WorkCentre 7525 Multifunction Printer is designed to help you with your day to day tasks. You’ll no longer struggle and get behind on your busiest days. You need this Xerox MFP to help with your business needs and output as well as lowering your costs. 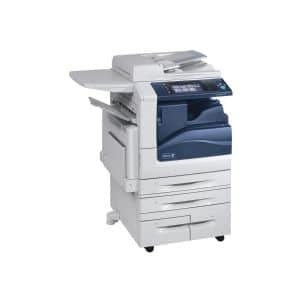 This Xerox Color MFP comes at a great price and produces 25 pages per minute! It features a tablet-like touch screen to make accessibility very easy. There are some intuitive features included that help with the speed of any task you have to do. Some of those features include mobile printing, added security features, and printing from anywhere in your office with the accessible wi-fi connection. It is important that you have an MFP that can handle your copy, print, scan and fax needs. The most important tool for any business is information and files. Ensuring that your files are safe is the most important tool and feature this copier can offer. With the high tech security features this copier offers, you’ll have nothing to worry about.